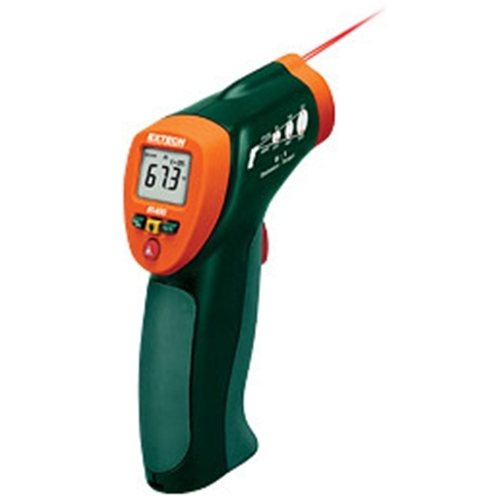 The compact IR 400 is a great tool to add to your existing equipment line up, providing a fast and accurate reading on temperatures up to 630 degrees F. The IR 400 by Extech was designed for a variety of applications, including automotive and heating system testing – as well as for insulation contractors to check quickly for current insulation and wall temperatures. With the IR 400, point and shoot, and get a reading in seconds that will allow you to efficiently identify areas within walls that have insufficient insulation. This is especially helpful during the walk through and bidding process, allowing you to easily illustrate for a prospect the differences in insulation composition within the walls. In addition, this provides insulation contractors valuable information for bid planning to ensure proper quoting and time allocation. The Extech IR 400 features a laser pointer, built in to pin point the target spot and assist in improving accurate aiming. The display is illuminated with a backlight, allowing for easy readings at night, or in spots that lack adequate lighting. Covering a range of -4 to 630 degrees Fahrenheit, this versatile compact tool can add great value and save time in a wide variety of applications. Place your order online today at Intech Equipment and Supply! Browse our full line up of Extech Instruments, or contact us for assistance.